I can’t believe I only found out about National Doughnut Day just last year! I was researching holidays and national days for a series of seasonal data collection and graphing resources. When I discovered National Doughnut Day, which occurs on the first Friday in June, I just knew I had to create a resource for this day! 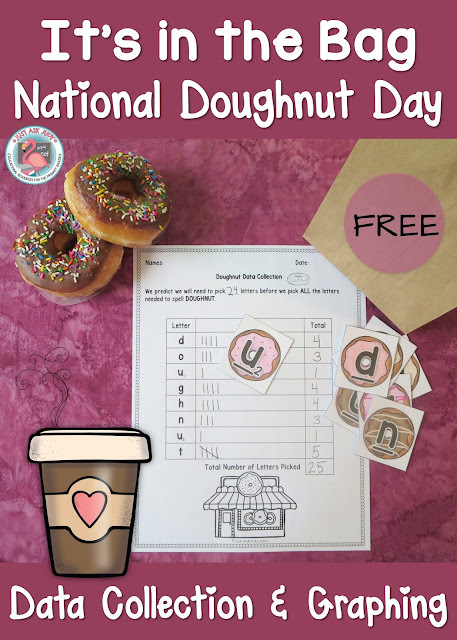 This activity engages your first, second, and third graders in collecting data by picking and replacing the letters of the word doughnut in a paper lunch bag until all the letters have been picked. Then, they use their collected data to complete a bar graph and answer questions, interpreting their graph. You will need to print color or black/ white letter tiles, the tally table, a bar graph (choice of 2), and the questions page. You will also need to provide paper lunch bags. The It’s in the Bag- National Doughnut Day graphing activity can be downloaded from my TpT store. Be sure to check out these additional graphing resources. You can find another donut themed graphing activity at Life Over C’s, suitable for younger children. Glued to My Crafts blog has a Donut Sprinkle Game, great for subitizing and counting, and appropriate for preschool and kindergarten. Although I have many years of baking experience, I had never fried or baked doughnuts before. 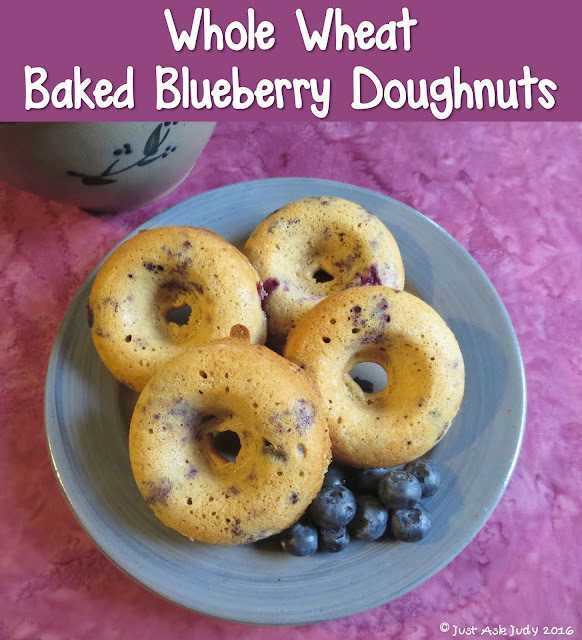 I found this recipe for Baked Blueberry Doughnuts at weelicious. If you make muffins from scratch, you can make these, too! You will need a donut pan. I typically use at least 50% whole grains in baked goods but find 100% is sometimes too dense, so I substituted 1/4 cup of flour with unbleached. I also used buttermilk powder and mixed by hand instead of using a mixer. It’s easy to overfill the sections in the donut pan but best if you don’t! If you absolutely must have a sugary confection, add a little (lemon) glaze on top. If these aren’t a healthy enough version for you, try the donut sandwich at Super Healthy Kids! Read about doughnuts and share some interesting tidbits with your kids. The history of doughnuts turns out to be somewhat dubious but this article from the Smithsonian Magazine has it covered. National Doughnut Day was created by The Salvation Army in 1938 as a fundraiser and a way to honor the Dough Lassies, female volunteers, who made and served doughnuts to soldiers (dough boys) during World War I. If You Give a Dog a Donut, one of many in Laura Numeroff’s If You Give series of books, provides a great basis for a writing extension activity or a comprehension lesson on cause and effect. The Hole Story of the Doughnut is a recently published fact-filled book written by Pat Miller, which includes legends about the history of doughnuts. 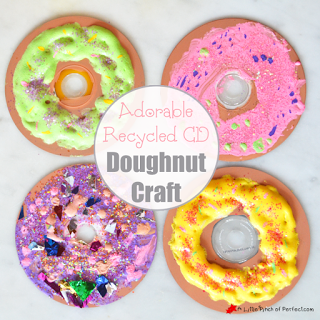 A Little Pinch of Perfect offers step by step directions for making these adorable doughnuts from recycled CD’s. Check out this paper plate donut craft from Happy Hooligans and these donut necklaces (an appropriate craft for older kids) from I Love to Create. How will you celebrate National Doughnut Day?